He was fourteen the year we built the quinzie, and I was seventeen, the youngest kid in grade twelve. Old enough to know better, our mother, a taciturn Irishwoman, was in the habit of saying. But even though she never said it to me again after what happened, I have said it to myself often enough. I have trained myself to never utter those words to my own son or daughter. But they reverberate in my head as I watch my twins go out into the sunlight, intent on testing themselves against the world. That is ridiculous, I know. All of life involves risk, and they could shatter their fragile bodies by sheer happenstance on the sidewalk right in front of this house. I am a cautious mother, in a way I never thought possible when I was seventeen and invulnerable, and Leo grows impatient with me even though he understands. “You have to let them go, Jess,” he says in his husky voice. But today, on the first anniversary of my mother’s death, it is too late to beg her forgiveness, or Jeremy’s, and I cannot find an olive branch within me to extend to my own hand. At the time, we lived south of Calgary, in the foothills near Priddis. God’s country, my mother liked to say. On early spring mornings, riding my horse through the aspens, when the light lit the far flanks of the Rockies, I knew she was right. Jeremy was bubbling over with excitement on the school bus one afternoon, lit up by a reference his teacher had made to a quinzie, a snow hut similar to the rough igloos he and I had built a few years earlier. “Jay, it’s freakin’ cold out there.” It was minus thirty-two that February day, and had been for a week. I nodded gratefully, then let myself be persuaded by my brother. Anything sounded more appealing that afternoon than reading Chaucer. I didn’t understand him at all, kept skipping ahead to the Romantic poets, Byron and his crazy dreams, and Shelley’s skylarks. I wanted to write odes to birds too, and kept a journal of all the birds I saw. 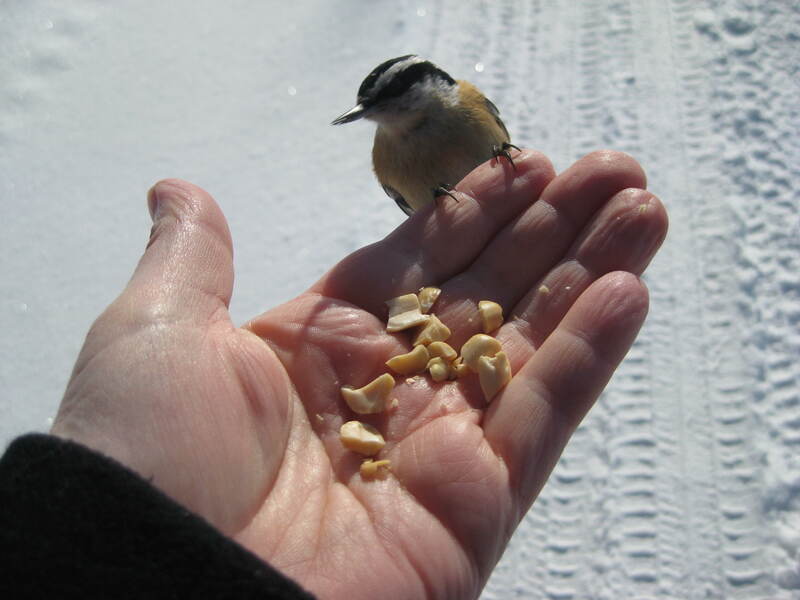 On our morning walks to the bus, the chickadees and nuthatches hung in a cloud above our heads, eager for the peanuts I carried in my pockets. They’d swoop down, falling like a piece of heaven onto my hand if I stood quietly and held out a handful. I had wings of paper describing them and other birds jammed in every pocket of every jacket I owned. Mom always wanted to know what we were up to, and her Irish accent got thick when she thought we were heading for trouble or when she thought Leo had been in my room for too long. But we managed to duck out of the house unnoticed, Jeremy with grain shovels over his shoulder, Mario, our giant black Schnauzer, plunging ahead. Cold settled on my cheeks and forehead, its stinging kiss settling into aching numbness that I impatiently smothered with my scarf. Jeremy led me to a clearing, a stone’s throw from where the lane’s double track curved toward the house, on the edge of the south pasture, aspens lining the north edge as a windbreak. It was a strategic spot: close enough to the house to meet Mom’s approval, but out of her actual sight. The snow lay untouched except for the deer tracks to the edge of the dugout, and the kiss of a pheasant wing alongside the imprint of a claw. “Here! This is perfect!” He showed me where to heap the snow, and we shoveled until well past sunset, sweat collecting along our backs and ribcages under our parkas and thermal underwear. I cut snow in perfect blocks that seemed to be made of nothing but light. Each block shattered when I dropped it from my shovel onto the growing pile, its mass reduced to crumbs of nothing. “Come on, Jess, just a bit more.” Jeremy looked frail, but he had been shoveling grain since he was a grasshopper, his skinny arms toughened into wire. I bent and carried, cut and dumped, finally throwing down my shovel and collapsing into a drift of untouched whiteness. A shadow fell across the slanted incline of snow, Dad tracking us down. “You kids! Haven’t you heard your mother calling you for supper?” His voice was as sharp as the wind that caught my face full on. I was suddenly aware that the sweat on my skin was cooling, and snow was wadded under my jacket. Jeremy walked beside Dad, talking with his hands as he explained our efforts, and I entered the kitchen alone to get both barrels from Mom. She slammed an empty pan onto the counter and crashed the oven door shut before she turned to me. Her black hair was pushed untidily behind her ears, and the lines around her blue eyes were stretched as tight as her voice. “Sorry, Mom. I lost track of time.” I grimaced and headed up the stairs to wash up, Jeremy close behind me, but Mom wasn’t done. The lilt of her voice followed us. “Mister research king, how about you spend less time on quinzies and more time on your homework?” Mom laughed, but she didn’t sound amused. She was leery of Jeremy’s propensity for research, stung by his announcement one day that her Celtic name, Deirdre, meant ‘sorrowful’. “She died of a broken heart, Mom. How cool is that?” Not cool at all, Mom had snapped. Tragic. “It’s okay, Deirdre. He’s learning lots. But no traplines, laddie.” He reminded Jeremy that he would have to kill, gut and skin the animals, and Jeremy quickly lost interest. But his fascination with the quinzie didn’t wane. Days later, the snow pile stood seven feet high and we began the grumbling effort to hollow out a shell.